From CNN’s Chris Cuomo to Vermont Sen. Bernie Sanders (I), when it comes to talking about firearm background checks, the left is completely comfortable telling total lies. 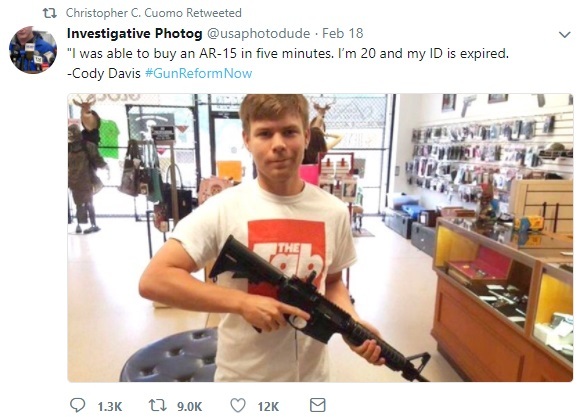 This week Cuomo, a*journalist*for CNN, retweeted a viral post from a 20-year-old man who claimed to have bought an AR-15 “in five minutes” with an expired ID. Just one problem: The young man didn’t actually purchase the firearm. In fact, he told the gun shop owner that he’d changed his mind before ever filling out the background check paperwork which would have revealed that his expired license made him ineligible to buy the rifle. When Twitter users called Cuomo out over the facts of the post, he simply doubled down on claims that the post is proof it’s too easy to buy a gun in the United States. Cuomo shot back, attempting that it was his detractors who were missing the point. Well, not exactly. The point is that the system worked: At no time did the young man purchase a firearm without showing proper ID and passing a proper background check. Cuomo proceeded to attack any view against implementing new gun control measures. He also insisted it is shameful to question the accuracy of anything he says. National Review editor Charles Cooke set Cuomo straight. Point is, it seems, that the left wants harsher background checks… even if it doesn’t really know why or how they would help stop mas shootings. And also totally false, it turns out. Washington Post fact checker Glen Kessler gave Sanders “four Pinocchios” for his claim. The figure Sanders is throwing around has long been debunked. According to the journalist, Sanders’ 40 percent figure comes from a 1993-1994 survey conducted before background check legislation even went into place. Furthermore, he notes that there were also other serious problems about the way the information was gathered for the report. The analysis concluded that 35.7 percent of respondents indicated that they did not receive their guns from a licensed firearms dealer. Rounding up gets you to 40 percent, although the survey sample is so small it could also be rounded down to 30 percent. The*original report*carefully used terms such as “acquisitions” and “transactions,” which included trades, gifts and the like. This subtlety is lost on many politicians, such as Sanders, who referred to weapons that are “sold.” But it’s an important*detail*because many of the people who obtained a gun without a background check either received it as a gift or inherited it. Why is it important to make a distinction between purchases and transactions? For one thing, the failed 2013*Senate compromise bill*that would have required background checks for gun shows and Internet sales specifically made an exception for gifts (and even sales) among family members and neighbors. Including the data on such transactions can change the results. Sanders now has even less of an excuse than Obama. That’s because in 2017, researchers at Harvard University finally published*a new survey*— and they found that 22 percent of gun owners who reported obtaining a firearm in the previous two years did so without a background check. That’s almost half the percentage of the old*figure. Moreover, among purchased firearms, the figure was 13 percent. That’s one-third of Sanders’s 40 percent claim. Once again, nonpurchased firearms (such as those acquired via a gift or inheritance) accounted for a large share of the weapons obtained without a background check. Though Sanders referred to the “gun show loophole,” not a single person surveyed said they obtained a weapon at a gun show without a background check. Which begs: If Sanders can’t even get his hands on accurate information pertaining to firearm-related issues, how can he possibly be trusted to produce effective new gun control legislation? The post Outright lies for gun control appeared first on Personal Liberty®.